InMotion Hosting is a popular web host among the shared hosting industry, but they bring a lot more to the table than simple shared hosting environments. They’re a multi-platform host, which means they allow you to use a number of different content management systems. We’re going to break down the services and features this host offers to give you a chance to see whether or not this is the right host for you. Let’s get started. InMotion Hosting was founded in 2001 and currently has a customer base of over 300,000 domains. The company has maintained a 3/3 star rating on CNET since 2003, and it has an A+ rating from BBB. This is a multi-platform host, as stated before. It supports a wide range of CMSs, which include, of course, WordPress, Joomla, Drupal, PrestaShop, OpenCart and Magento. It’s also a multi-level host in that it offers a wide variety of server types, from typical shared hosting plans to cloud hosting and even reseller hosting plans. Let’s talk about these plans in depth. Not only does InMotion Hosting offer a variety of different server types, it also offers multiple plans for every server type it has. Let’s talk about its shared hosting plans so we can learn a little more about this. It should be noted, however, that all plans come with a 90-day, money-back guarantee (excluding dedicated hosting plans), free 24/7/365 support, unlimited email accounts, free SSL certificates and free backups. The regular prices for shared hosting plans range from $7.99/month to $15.99/month, as you can see in the image above. These prices may be lower at times depending on whether or not InMotion Hosting is offering a promotion. You can also gain access to an exclusive 40% discount when you use our coupon code. Details here. There are also six dedicated hosting plans, each of which come with a much shorter 30-day, money-back guarantee. These plans start at $189.99/month and go as high as $589.99/month. What’s dedicated hosting, you ask? If VPS hosting is for growing business, dedicated hosting is for enterprises. There’s also reseller hosting for as little as $27.99/month, which is a plus for developers. InMotion Hosting does market WordPress hosting on its site, but these plans are no different from the shared hosting plans. 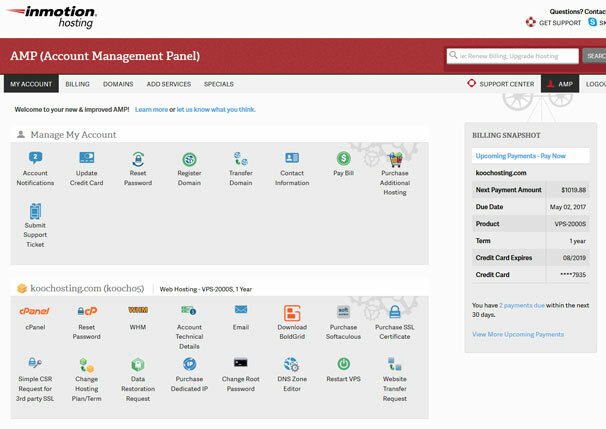 When you signup to Inmotion Hosting, you are given access to their Account Management Panel ( AMP ) which is your dashboard to access all the features of your hosting account. From here you can manage your account by changing payment details, transferring domains, updating your contact information and purchasing additional services. You also have a section for each hosting plan you own, which gives you access to a lot of powerful features. You can access cPanel and WHM from here as well as changing your root password, you can purchase SSL certificates, change your hosting plans and so on. 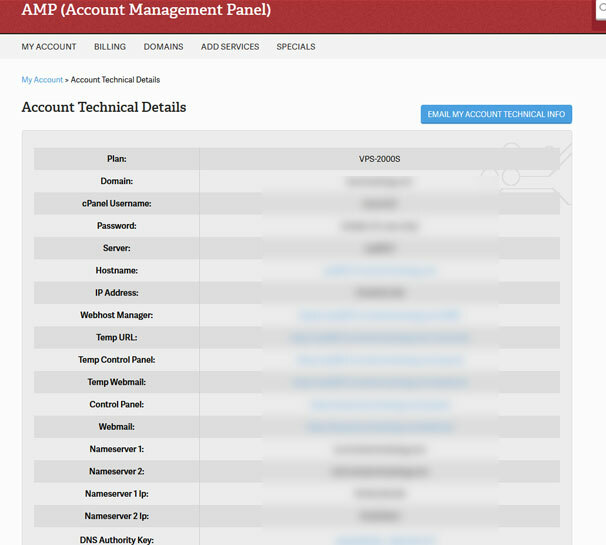 One excellent feature is the “Account Technical Details” link which gives you easy access to all the info you will need about your hosting – IP addresses, username, password, nameservers etc. This is really useful to have all listed in one place that you can refer to as needed. InMotion Hosting offers “premier support” for all plans free of charge. This support is available 24 hours a day, 7 days a week and 365 days a year. It comes in a variety of different formats, including phone, live chat and email. You can also seek help from other InMotion Hosting customers in the company’s community-driven Q&A section. Support agents are even based in the United States, and they’re prepared to help customers of all experience levels. This ranges from business owners with zero experience in web design to professional developers using InMotion Hosting to power client websites and projects. Beginners even have access to New Account Specialists. 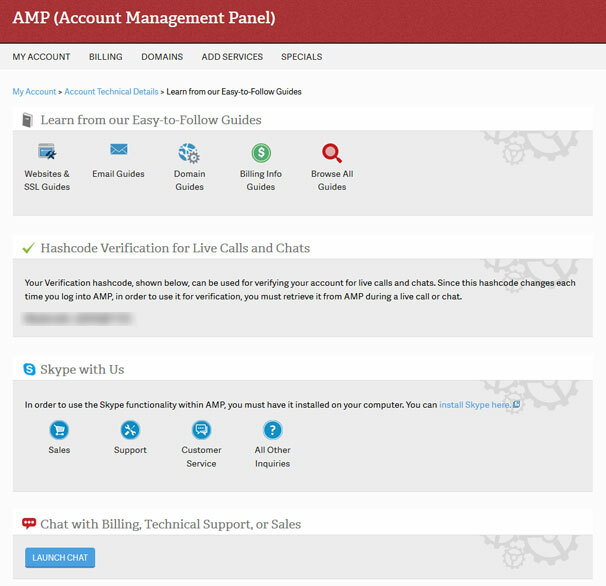 Support can be accessed via the account management panel and includes a number of option. I normally use the live chat option and have always been connected to someone within a few minutes who have solved my issue quickly. Inmotion offers some of the best support that I have come across, so if this is important to you then they are worth checking out. InMotion Hosting also offers a managed hosting service you can add to your account for a premium price. This service helps you with things like ensuring your server has the best security available and helping ensure your site is optimized. Something else you need to bare in mind with a hosting company is the speed of the service, slow hosting is no good – it will cost you conversions, deter visitors and can even have an effect on your search engine rankings – faster sites place higher in the results due to lower bounce rates and possibly a Google algorithm ranking factor nowadays. Here I carried out a test using Pingdom using a new WordPress installation and default theme, as you can see it had a load time of 875ms which was faster than 91% of other websites – a very good result for a shared host. 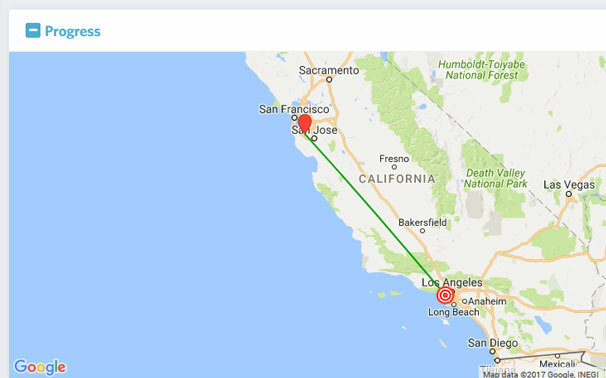 Next, I tried a LoadImpact test, running from San Francisco to the hosting location in Los Angeles USA. 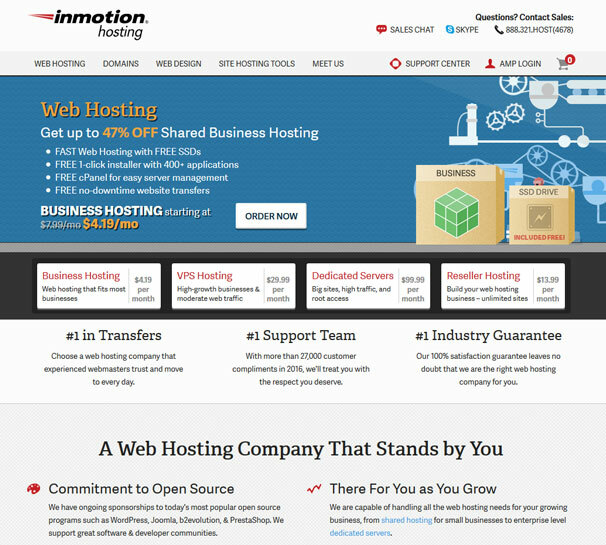 Inmotion has very good results for a shared hosting company so your site should load nice and fast with them. There are a number of different positive elements that come along when you choose to host with InMotion Hosting, but we’re going to focus on a select few, starting with the amount of diversity that exists within its plans. InMotion Hosting offers something for everyone. It doesn’t matter if you’re a small-time blogger or an enterprise-level ecommerce business. You’ll find a plan that comes with a server capable of handling your site. This variety also gives you plenty of room to grow. InMotion Hosting offers several layers of security. This includes the free SSL certificates and backups we already talked about, but it also includes advanced DDoS protection, various firewalls depending on the plan you’re on as well as a 99.9% uptime guarantee that makes you eligible to receive a free month of hosting if your average uptime performance falls beneath 99.9% within a 30-day period. InMotion Hosting allows you to rely on fewer services by allowing you to register an unlimited number of domains, create an unlimited number of business email accounts and store an unlimited number of emails. InMotion Hosting is developer friendly. They offer reseller hosting, WP-CLI for WordPress, the ability to work with SSH and develop with PHP, MySQL, PostgreSQL, Ruby, Perl, and Python as well as the ability to use a number of different content management systems. There are a few disadvantages that can make your hosting experience with InMotion Hosting appear limiting. Let’s go over them. You can technically create a staged version of your site on your server, but it involves following a number of different steps inside of cPanel. Other hosts, on the other hand, allow you to create a staged version of your site with one click. Many hosts partner with CloudFlare or MaxCDN to make enabling a CDN for your site as simple as can be. InMotion Hosting supports CDN services, but it doesn’t have any built in. This host has a number of different plans that each have a number of different specs, but they don’t let you know how much traffic each plan can handle. The cheapest shared hosting plan only allows you to have two databases. This limits the number of additional websites you can create on your server, which means any budget project that requires WordPress multisite, which creates a subdomain for every additional site you create, is out of the question. The bright side is that it prevents certain accounts from hogging too many resources on the shared server your site is on. The short answer is “everyone.” That’s the benefit of choosing a host that offers a wide variety of plans and multiple levels of hosting. It allows you to start out small with a cheap shared hosting server and upgrade to a cloud server when you need to. In my experience Inmotion has some of the best Customer support I have experienced – I found it to have fast and accurate replies and quick resolutions to any queries or issues I experienced so if you are a beginner or someone who needs help from time to time they are highly recommended. Inmotion are one of the best shared hosts around so give them a try. For the best performance and good customer support and after-sales service, I can surely give the 8 out of 10 to the Inmotion Hosting. The features and attractive freebies are also a part of the review score and for that, I can give it a complete 4 out of 10 because it is for a newbie and I am not one of them. I need better service for my hard earned money that I am paying to the hosting provider. When it comes to Inmotion Hosting- Yes, this web hosting server comes with several attractive and engaging features. This is a highlight attraction for the users, most particularly the beginner level users. But there are many minute and petite issues that refrain this website hosting server from becoming the best one. 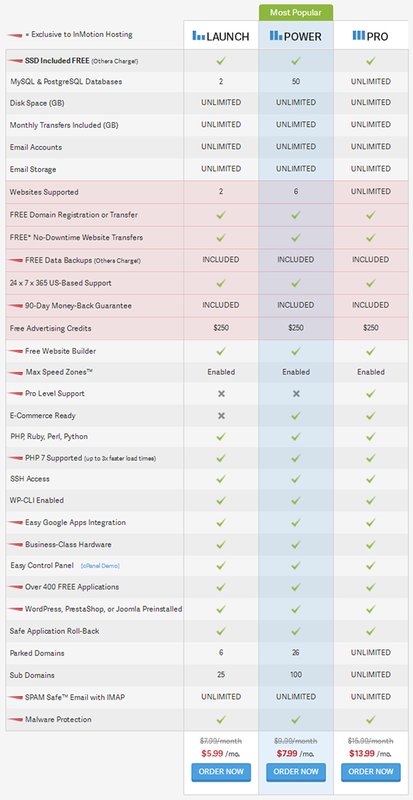 If you question whether you can find the better web hosting options in comparison to this one – yes, you can! This web hosting service is good – beyond average but definitely not perfect or seamless.